I was praying that this brined roasted turkey roll would work out well. So why a turkey roll and not a whole turkey? Well, now that I have had the experience of making a whole turkey and a turkey roll for Christmas. It’s clear to me that a turkey roll is definitely a lot more stress-free. 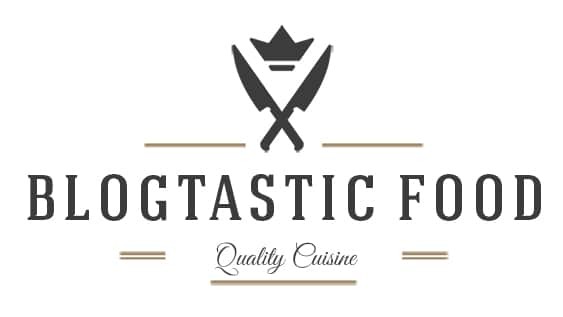 Easy to carve, quicker to cook, don’t have to deal with bones, cheaper to prepare etc. Now if you are thinking “one turkey breast? Will that be enough?” Don’t be fooled, this ain’t no chicken breast remember. As a large turkey breast is much bigger than you think. And once you incorporate the stuffing and roll it up, you realize that it can feed quite a few people. But of course, it won’t feed as many people as a large whole turkey. As it says in the recipe one large turkey roll will feed about 8-10 people. So what is the one thing many of us worry about when it comes to cooking chicken or turkey breast? Other than making sure it actually is cooked through. That’s right, making sure it doesn’t go dry. So that is why I brined the meat. And if you don’t know what that means, it’s literally just soaking the meat in flavoured liquid for a long period of time. This will make the meat much moister, but it will also season the meat more effectively than just sprinkling salt over it, as dry salt can fall off while cooking. Thank you all so much for checking out this post, I appreciate every last one of you and I hope you all have an awesome Christmas. Catch you all soon!!! 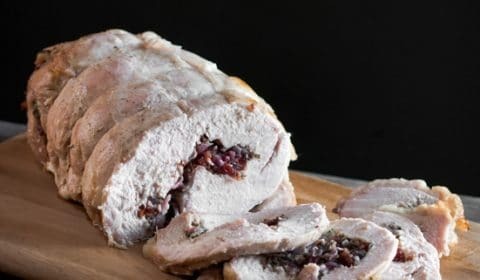 A super delicious, comforting and much less stressful turkey dinner for the family to enjoy on Christmas. You will love this brined roasted turkey roll. Put the water, salt, peppercorns, cloves and bay leaves in a pot and bring the liquid to a boil. As soon as the liquid starts boiling turn the heat off, transfer the liquid to a large bowl or container and leave in the fridge covered to cool. Get couple of large sheets of cling film and place over the top of the turkey. Then use a meat tenderizer or rolling pin to bash the turkey until the whole breast becomes a surface that is even in thickness (about 1 - 2 inches thick). Once the brine has cooled down, submerge the meat in the brine liquid, cover again and leave in the fridge overnight. Get a large frying pan on medium heat. Add your olive oil, then your onions and fry for about 3-4 minutes. Once the onions start breaking down and go soft, add your butter and melt through. Next, add your cranberries, breadcrumbs, parsley, sage and mint. Mix together well in the pan, turn the heat off and season with salt and pepper. Pre-heat your oven to 160 (325 degrees F) degrees Celsius. Take your turkey out of the brining liquid, then dry with kitchen paper or a cloth. Place the turkey out flat on a board skin side down. Add your stuffing over the top of your flattened turkey breast nice and evenly. Then carefully and firmly roll up the turkey into a cylinder shape. Get some kitchen twine, and tie about 6 firm knots along your rolled turkey to keep it nice and sealed. Rub the 50g grams of butter over the turkey roll, wash your hands, then lay your bacon strips over the top. Line a roasting tray with baking paper, put your turkey roll in the tray and roast in the oven for 1 hour and 50 minutes. Once the turkey is cooked, take it out of the oven, cover with tin foil and let it rest for about another 20 minutes. Cut the string off, start carving and serve with some veg and gravy. Enjoy!!!! 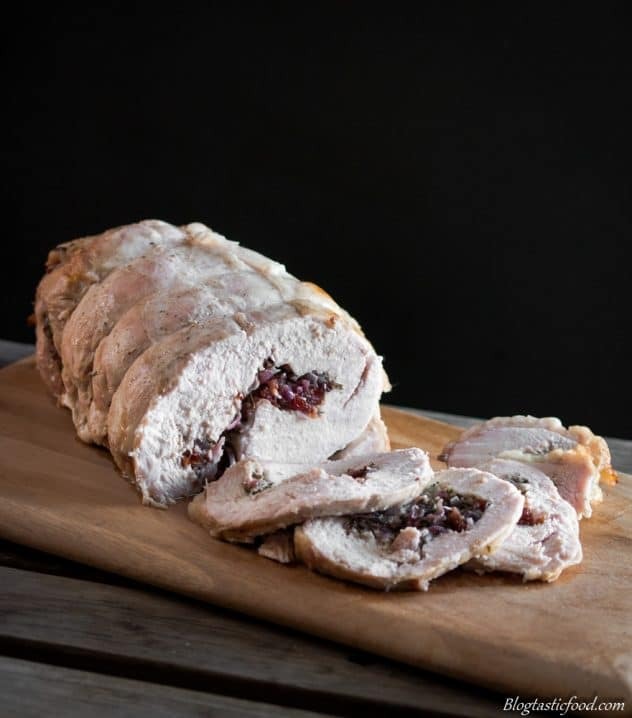 Before you make this brined roasted turkey roll recipe, remember that it is recommended that you brine the turkey overnight. So make sure you prepare in advance. I hope you enjoyed this brined roasted turkey roll. You may also want to check out the Christmas Pork Belly with Crackling recipe I made for last year’s Christmas. 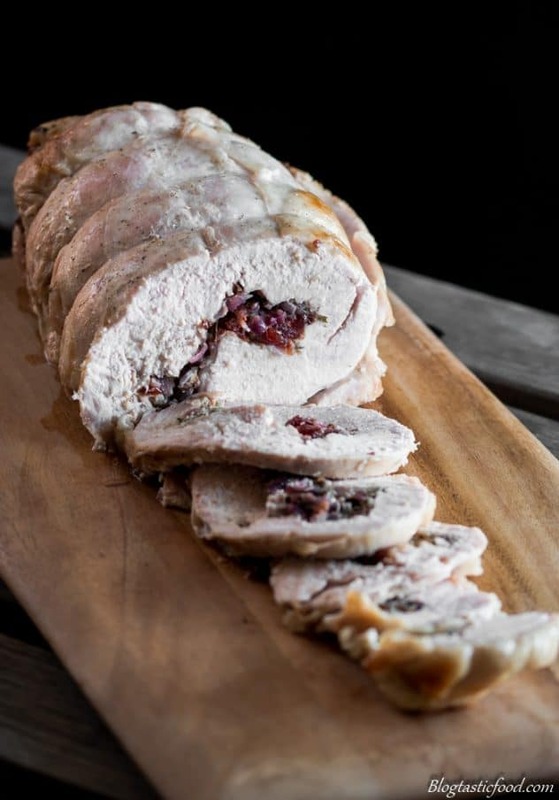 Beautiful moist turkey roll. I’m not a long time proponent of the sweet/savoury pairing but sometimes it just works and cranberries in the filling is a great idea. Creative, appetizing, and sheer goodness all rolled in one.